The Land of Secrets. It is interesting how people from different civilizations are egocentric and want to enforce their values over other people who simply don’t live their way? We think that we do the best, we live the best way and underestimate others. Even in 21 century there are tribes that function in mysterious closed systems away from civilization and modern world. And they are happy about it! Very often some ‘civilized’ guy will come and try to persuade them to leave that way of living and to join the civilized world. For a long time Kevin has planned today’s trip. He has always wanted to meet with one of the most mysterious tribes in the world that lives in complete isolation from the modern world. No one knows anything about this tribe. They are actually great mystery for the whole world. Kevin wants to find out as much as possible for these people, but they won’t let Kevin enter their world easily. They are preparing themselves to pose few questions to Kevin. He has to give exact answer if he wants to enter deeply into their village and to meet the headman of this tribe. 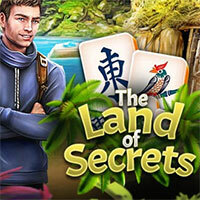 The Land of Secrets is a free online hidden object game on Hidden4Fun.